Geneticists are a step closer to understanding how plague evolved into one of the great scourges of human history. Yersinia pestis, the bacterium that causes bubonic plague, spreads through the bites of infected fleas. In the fleas gut, plague bacteria multiply until a mass of bacteria blocks the passage to the fleas stomach. The starving flea bites a host and feeds frantically, but since it cant swallow its meal, it ends up regurgitating blood and bacteria back into its preys bloodstream, spreading the disease to a new host. Inside a mammalian host, Y. pestis travels through the lymph system until it reaches a lymph node, like the ones near the armpits or the groin. There, the bacteria multiply, causing the dark, swollen lump called buboes that give the plague its name. Plague patients also face dangerously high fevers, along with headaches, nausea, coughing, and (in modern times, at least) the horrifying realization that they got it from flea vomit. That ruthlessly efficient system helped bubonic plague kill nearly 25 million people and made the ancient world shudder in its tracks during the Justinian plague of 541–542. Its likely return, according to the most widely accepted data at least, killed somewhere between 75 million and 200 million more during the Black Death of 1347-1351. But we still dont know much about how the bacterium evolved to spend part of its life in an insect host. Using a vector for delivery is a handy trick for a pathogen, but its also a remarkably specialized way of life. Some new samples of 3,800-year-old Y. pestis have provided us with the oldest plague genomes ever sequenced that show all the adaptations necessary to survive and multiply in fleas. The oldest Yersinia pestis genomes scientists have sequenced so far came from the remains of people buried across Eurasia during the late Neolithic and early Bronze Age, between 3,000 and 5,000 years ago. Theyre a group of related strains, clearly different in important ways from the bubonic plague strains we see today. Their genetic code lacks some of the major adaptations that let the bacteria survive and reproduce in the gut of a flea. But even if we dont know how the early Bronze Age version of plague spread, those ancient genomes have let epidemiologists reconstruct how the plague mutated and evolved in subtle ways as it spread across Eurasia. That pattern closely matches the patterns of human migration during the Bronze Age, so its likely that the disease was somehow spreading among humans or their livestock. Now, Spyrou and her colleagues have sequenced Y. pestis genomes from fragments of DNA found in the teeth of a man and a woman buried at a Bronze Age cemetery in southwest Russia. This plague strain had all the hallmarks of an organism adapted to the vector-borne lifestyle. “During a persons lifetime, blood flows within the inner part of their teeth (or else called the pulp chamber) and, hence, after death, teeth could potentially encapsulate any bacteria that were present in a person's bloodstream,” said Spyrou. What she and her team have recovered are fragments of DNA, not whole plague bacteria. Based on the condition of their bones, the woman was between 35 and 45 years old when she died, and the man was between 30 and 40 years old. Like others in the cemetery, they were members of the local Srubnaya culture, which shared ancestry with both Yamnaya pastoralists from the Eurasian steppe and early European farmers. The two apparent plague victims were buried together in a kurgan: a wooden chamber beneath a mound of earth. 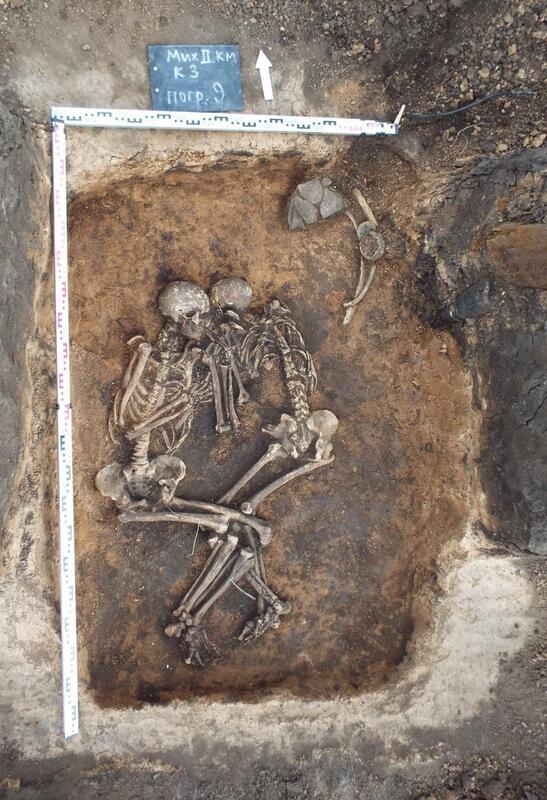 Seven other people buried in the same cemetery had no trace of plague. Part of bubonic plagues adaptation to its insect host involved losing or inactivating four important gene sequences, usually because one nucleotide got substituted for another, inserted, or deleted. Without those sequences in working order, bacteria are better at colonizing and spreading through insect vectors like fleas—but in older Y. pestis strains from the early Bronze Age, all four of those genes are still active. The strain had also acquired a gene that, in its ancestral form, makes the bacterium very inefficient at infecting mammals. But a single DNA change makes it much better at transmission to hosts like rats, prairie dogs, and humans. According to comparison with other ancient plague genomes, which let scientists sort the strains into a family tree, this lineage had been around since about 4,000 years ago. That means bubonic plague as we know it is about a thousand years older than anyone thought. The oldest plague genome anyone had previously found with everything needed to spread in fleas was a 2,900-year-old strain in a plague victim from Armenia. So by 2000 BCE, bubonic plague was ready to ride ticks between species. But the date of the newly sequenced strain means it was probably circulating at the same time as the strains sequenced from the early Bronze Age, 3,000 to 5,000 years ago, which werent adapted for flea transmission. According to Spyrou and her colleagues, its likely that these were two of at least three lineages of plague circulating among people and wildlife in Eurasia at the time. That means that, by 3,800 years ago, the earlier variants of the plague had branched into multiple lineages with very different evolutionary strategies. That branching seems to have been part of a Y. pestis population explosion around 4,000 years ago, which is when phylogenetic analysis of ancient bacterial genomes suggests that plague strains diversified rapidly. This is probably because the disease evolved into different lineages as it was spread to new areas and new populations. This boom period for bubonic plague kicked off about the time that horses became a common means of transportation on the steppe, enabling people to move faster and more often through the Central Steppe region—a region that would spend the next several centuries as a corridor for not just people and trade goods but deadly epidemics. Thats how the Black Death is suspected to have reached Europe in 1347, although epidemiologists and historians have debated for decades whether Y. pestis deserves all, or any, of the blame for the Black Death. Some researchers have suggested that the symptoms and rate of transmission described in historical accounts actually match anthrax, or possibly a hemorrhagic fever like Ebola or Lassa, better than Y. pestis. Others have suggested that accounts of the Black Death may actually be describing simultaneous outbreaks of several diseases, including bubonic plague. Of the Bronze Age plague lineages, only two survive today. One, often called microtus, contains several strains that arent infectious to humans, along with several that are. The other contains the Y. pestis strains responsible for the Justinian plague, possibly the Black Death, and a devastating epidemic in 19th-century China. Phylogenetic analysis suggests that the earliest common ancestor of all those plague strains probably branched off from the bacteria Y. pseudotuberculosis some time between 5,727 and 6,797 years ago. Spyrou and her colleagues want to sample more Bronze Age plague genomes in order to better understand how the disease evolved during that crucial period in its history. Nature Communications, 2018. DOI: 10.1038/s41467-018-04550-9 (About DOIs). Enlarge / Lasers, magnets, and superconductors, oh my! The lasers have nothing to do with this story..